Last Thursday, internationally-renowned conductor Gustavo Dudamel announced that the Los Angeles Philharmonic would be establishing a state-of-the art music and cultural campus in the heart of downtown Inglewood for his beloved Youth Orchestra Los Angeles (YOLA). This is yet another amazing development for a city that just a few years ago was struggling. Today, Inglewood can boast of construction of a new football stadium and a light rail line that will connect the city with the entire region; it will also be home to at least two — and possibly three - major sports teams, several entertainment venues and, now, the LA Philharmonic is establishing a significant cultural presence by making a long-term investment in the city. YOLA will be headquartered in the 17,000-square foot former bank building adjacent to City Hall, which will be redesigned by Frank Gehry who also helmed design and construction of the LA Phil’s iconic Disney Hall. This new YOLA site will house classrooms and rehearsal space to accommodate a full range of the youth orchestra’s activities and services, including access to free instruments and intensive music training. 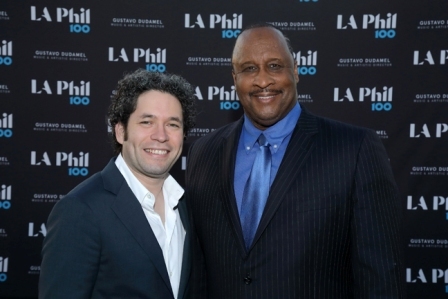 Dudamel thanked Inglewood Mayor James Butts for his leadership and vision in helping bring the LA Philharmonic to the city and promised a partnership that would benefit the city and its youth for generations to come. Inspired by music from a young age, and building on his background with the “Sistema” which brought musical training to Venezuela’s children, Dudamel started YOLA 10 years ago when he arrived at the LA Phil He is known for his unwavering commitment to bringing world class musical exposure and training to young people of all backgrounds who might not otherwise have such opportunities. Currently, over 1000 young people aged between 6 and18 participate in YOLA at four sites across Los Angeles. Equally impressive is that, after the LA Phil looked at numerous locations throughout Los Angeles County, its leadership focused on securing the downtown Inglewood site. Recognizing the imminent completion of a light rail station just blocks away affording easy transit access to the venue, several new housing and retail projects slated for the area, as well as the mega developments also taking place, it’s apparent how Inglewood emerged as the preferred new campus. From light rail, and construction of a new stadium, to re-envisioned entertainment venues (The Forum and Casino), and a possible new basketball arena, one can only marvel at Inglewood’s juggernaut and wonder what could possibly be next. Welcome to the City of Maestros!